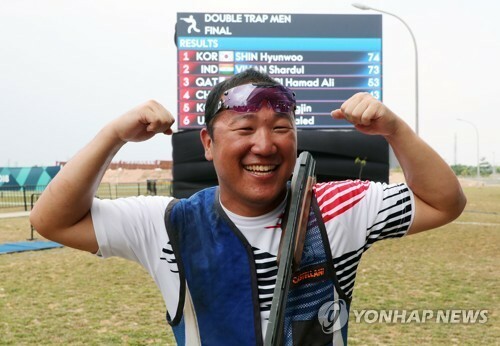 South Korean shooter Shin Hyun-woo won a gold medal in the men's double trap competition at the 18th Asian Games on Thursday. Shin scored 74 points to finish first among six final contestants at the Jakabaring Sport City Shooting Range in Palembang, Indonesia, the co-host city of the Asian Games with Jakarta. The 34-year-old trailed 73-72 against Shardul Vihan of India with two shots remaining. He cleared his last two shots, however, to collect a one point victory over Vihan. Ali Hamad Al Marri of Qatar took bronze with 53 points. This was South Korea's first shooting gold at Jakarta-Palembang 2018. Prior to Shin's gold, South Korean shooters had won three silvers and two bronzes. Shin also became the first South Korean to win a gold in the double trap competition at the Asian Games. In double trap, participants use a shotgun to break a clay disk flung away from the shooter at high speed. They have to shoot down two targets released simultaneously from the house.